Franc Lanko Marušič and Rok Žaucer, eds. Abstract: This paper discusses a colloquial variety of Polish relative clauses introduced by the uninflected relative marker co. Unlike previous accounts, the analysis concentrates on authentic spoken utterances marked by structural unintegration—a common feature of spontaneous spoken language. As is shown, co clauses in unplanned speech depart from the traditional perception of what function they perform and how they do it. The advantage of using corpus data is that they offer insight into a wider range of functions of co than previously reported. These functions include a weakly subordinating conjunction, a general discourse connective, and time- and place-reference conjunctions similar to English when and where. Additionally, some cases are ambig- uous as to which of these functions co serves. The basic relativizing use of co is also revised and its description is enriched by an analysis of co clauses in spontaneous speech, in which several unintegration features were observed. They are in general related to the loose syntactic relationship of the head NP to the co clause. Specific features of unintegration include (i) co clauses as complete clauses with no gaps, (ii) idiosyncrasy and context-dependency of interpretation, (iii) nonmatching case forms and lack of required resumptive pronouns, (iv) preposition ellipsis, (v) long-distance relationship between the head and co clause, (vi) ambiguity in the semantic contribution of co clauses and of the marker co itself, and (vii) lack of a clearly specified nominal head. Abstract: This paper concerns Bulgarian da-constructions (daCs), phrasal structures that correspond to subjunctive or infinitival structures in other languages. In combining two theoretical contributions to the syntax and semantics of Bulgarian subjunctives, an attempt is made to reconsider the Bulgarian mood system, focussing on daCs. The crucial claim is that daCs mark the absence of the indicative being associated with the supposition of subject certainty (Siegel 2009). Accordingly, da is a semantically vacuous mood marker chosen when the indicative would cause a semantic failure. By adding Krapova’s (2001) distinction between [+T] and [-T] daCs, their correspondence to subjunctive or infinitival structures in other languages follows immediately. 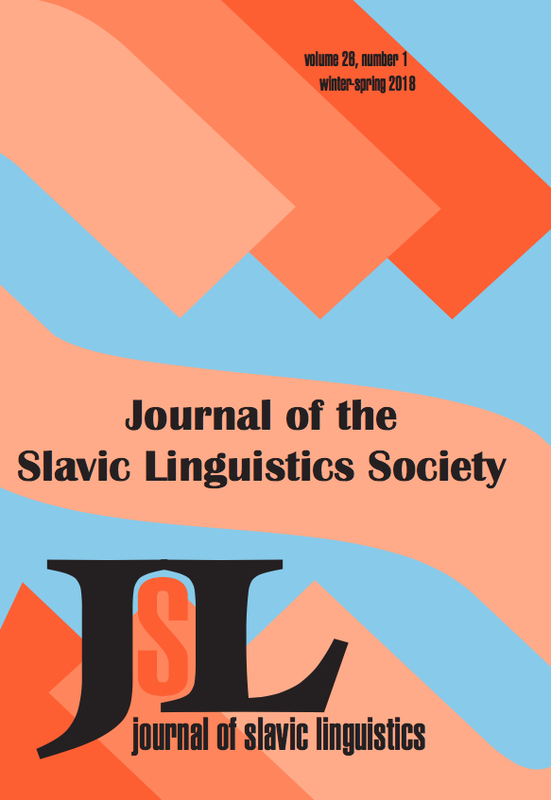 Abstract: This paper proposes a scalar analysis of polysemy of Russian verbal prefixes. The lexical entry remains constant throughout all uses of a given pre x: it relates the event, denoted by the prefixed verb, to a scale. The specific kind of transition denoted by the prefix is the source of the similarities in meaning. The structure, into which the prefix is inserted, varies and determines the scale along which the event is measured out, which may be a path (with verbs of motion), a scale of change, or the temporal trace of the event. It is demonstrated that the semantic differences go hand in hand with structural differences and that the meaning of a prefix is predictable based on the event structure of the verb it attaches to. If the verb lexicalizes a scale of change, the prefix must measure out the result, mapping the event onto a scale, which is the complement of the result. If the verb contains conflated material and is incompatible with a result, the only available position is above aspect, where the superlexical pre x measures out the time of the event. A direct object may serve either as the resultee undergoing a change of state or as the measuring scale (as in the case of spatial and consumption verbs). Many verbs are flexible, and then the pre x may take on different meanings and the structure depends on whether the event is interpreted as involving a change of state or an unbounded activity.